The recent reincarnation of Hairspray reminds us that America's segregated past is still part of our national dialog. Black Americans' stories of survival under those absurd laws are inspiring. Black heroes often went unsung, unnoticed and unrewarded. Today because of one African-American who excelled in her field, the Academy of Motion Pictures Arts and Sciences is poised on the brink of a crisis of conscience. 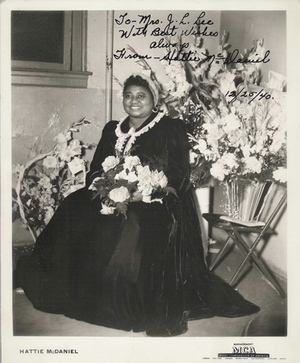 Hattie McDaniel is best known for her portrayal of "Mammy" in 1939's Gone with the Wind. She was born in Kansas in 1895, the same year Booker T. Washington delivered his famous "Atlanta Compromise" address. One hundred and thirteen African Americans were officially reported lynched in 1895. Mr. Washington was born into slavery, but his eloquent speech never lambasted any former slave owners. He pragmatically asked for jobs for people who needed work. Offering an olive branch, he counted on a natural policy of good being drawn to good in order to advance difficult lives. One hundred and thirteen African Americans were reported lynched in 1895 -- at least that was the "official" number. Jim Crow laws that mandated the "separate but equal" ruling were enforced throughout Hattie McDaniel's life. These edicts supported segregation turning back gains black Americans were granted in the era of reconstruction. White Supremacists who defended Jim Crow laws cited examples supporting oppression contained within the bible. Like today, the separation of church and state was marked by a dangerous dotted line. In 1915, DW Griffith released Birth of a Nation, the silent epic lauding the Ku Klux Klan. Not coincidently in that same year the Klan was reinvigorated as a Christian organization. The KKK openly recruited in white churches attracting members including the clergy. Still today, the Ku Klux Klan envisions itself defending, what they call 'true Christianity." When Gone with the Wind premiered in December of 1939, most of its stars were present for the grand gala; the black actors were not welcome in Jim Crow Atlanta. When McDaniel's portrait was printed on the back of a movie program, the brochures were destroyed. New programs were printed with a picture of Alicia Rhett, a minor character, taking the star's spot. The Ambassador Hotel's swanky Cocoanut Grove was decked out in Hollywood style for the Twelfth Annual Academy Awards Presentation Dinner on February 29, 1940. Hattie has nominated for Best Supporting Actress. She was segregated into the ballroom's black section. That night an emotionally elated Hattie won her historic Oscar not by playing a maid, but a slave. Critical acclaim for her role as "Mammy" was followed by criticism. Throughout the 1940s, many enraged African-Americans became frustrated with her McDaniel's stereotypical black servant roles. Writers perpetuated the image of the southern mammy. Happy, obedient, slightly awkward black comic foils were a 'forties film staple; Hattie accepted the only roles that were ever offered. Her response was she'd rather make "seven hundred dollars playing a maid than seven dollars being one." McDaniel's characters were strong-willed women who commanded a household, but also answered the door. When Rosa Parks refused to give up her seat at the front of the bus in 1955, social change was poised take its quantum leap. Her civil disobedience forced Americans to deal with racial segregation. The 381-day Montgomery Bus Boycott was a success, thanks in part to television, timing and the leadership Rev. Martin Luther King and E.D. Nixon, the boycott's organizer. Hattie McDaniel never knew Martin Luther King's push towards an integrated America; she died three years earlier. McDaniel lived her entire life under the Supreme Court ruling of 1896 that stated "separate but equal" was fair in the United States. A life burdened by legalized segregation was all she ever knew. Jules Roth, managed the "Hollywood Memorial Park Cemetery" where so many of her fellow stars and friends were interred. Because of her race, he refused to allow the winner of Hollywood's highest award to be buried on the property. For Hattie, even death discriminated. In her will, the star divided her modest estate, valued at less than $10,000, among several friends and relatives. She left $1 to her former husband, Larry C. Williams, and willed her history-making Oscar to Howard University. Hattie McDaniel hoped that her golden boy would never be buried in an archive, but instead would stand as a beacon of pride and inspiration to future generations of Howard students. Within minutes of the Memphis shots that assassinated Martin Luther King, civil unrest burned hot across America. From our nation's largest cities television cameras were broadcasting searing rage, frustration, and chaos into America's living rooms. Four days later, after the smoke had cleared, the destruction was catastrophic. Death, looting, injuries, and arrests were catastrophic. The riots that had flashed in Memphis also ignited just blocks from Howard University in Washington DC, leaving our nation shattered and divided. After the riots of '68, no one would ever see Hattie McDaniel's academy award again. Furious, frustrated black Americans are rumored to have heaved the Oscar into the Potomac River in effigy of racial stereotyping. Like Hattie herself, it too is buried in the wrong place, a victim of misunderstanding and hate. Howard University is forced to take the official stand that the award is "missing" because no witnesses to its watery interment have ever come forward. My telephone inquiries to the Academy of Motion Picture Arts and Sciences in Beverly Hills -- who issue the awards and could reissue a new one in Hattie McDaniel's name to Howard University -- were answered by the same official line: it is "missing," which, the Academy states, is not reason enough to reissue the historic, hard-won statuette that means so very much to so many Americans and their predecessors. Happily, today's Hollywood Memorial Park Cemetery owners aren't as difficult as the Academy. In 1999 Hattie got her chance to be buried in the final resting place she had stipulated. Tyler and Brent Cassity, who have bought the Hollywood property, renamed it "Hollywood Forever" and offered to move Hattie's remains from Culver City, California to Hollywood. Her family declined their offer; they did not want to disturb her remains after 47 years. The Cassitys erected a respectful monument to Hattie on one of the property's most coveted plots. Perhaps with some prodding and pushing, the Academy will see fit to close this final chapter on the first person of color to win an Oscar. Hattie McDaniel was one of Hollywood's, and America's, most heroic citizens. She not only survived but also thrived during a time when people like her were officially, legally discriminated against. Born separate but equal and dead before integration, McDaniel achieved remarkable things against all odds. It's time for the Academy to do the right thing and reissue her Academy Award; in Tinseltown, that would be living life by the golden rule.